Hand-crafted brass, copper, and stainless steel. There is only the one burner: it runs on firewood, gas, or other solid fuels. Heats the tub in (usually) well under two hours. You can also make coffee on it. 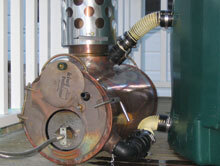 The burner puts the 'hot' into the hot tub without needing a pump or electricity. The usual fuels are firewood or gas, either of which can be used in the one burner. Any heat source inside the burner heats the water which circulates through the tub. The inside copper cylinder is corrugated which gives a greater surface area for heat exchange. A stainless steel baffle spreads the flames onto the walls of the burning chamber and creates a longer flame path to heat the water. There is no automatic temperature cutoff. Kiwitub is designed for outside use under adult supervision and with manual control. When the water in the tub is hot enough, simply turn off the gas (and leave it off: the tub will stay bathing hot for hours). If you're using firewood, the fire can take up to half an hour to die down, so stop feeding it before the tub gets hot enough. It doesn't take much practice to estimate this correctly. The burner is copper because this transfers heat and resists the corrosive effects of sea water better than stainless steel. The 6mm thick door, carrying handles, legs and drainage tap are cast in brass. The burner sits on its belly, with the two legs at the back ensuring it is stable on all surfaces, like a three-legged stool. 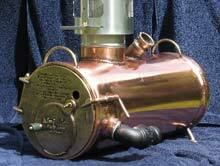 We think the copper and brass main burner should last for 200 years. This is not mad hype. There are no moving parts like pumps or motors to go wrong or wear out, and the heat from the burning chamber is transferred to the water surrounding it and circulated away into the tub, so it won't eventually burn through like a cast-iron potbelly stove. My Dad's Thermette water heating jug which similarly has water surrounding a copper firebox is 70 years old and going strong. In 1795 the old 'Endeavour' (not Captain Cook's one) was scuttled in Dusky Sound, after damage in a storm while supplying sealers and whalers. When you dive to it, the wood crumbles to the touch, but the copper nails and sheathing are fine. 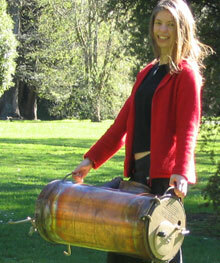 The burner is 330mm (13") in diameter and 730mm (2'5") long. It weighs about 24kg (53lb) so one person can carry it, though two are better for long distances: it has a big brass carrying handle at each end. 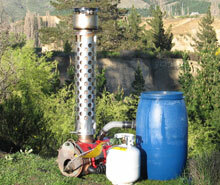 The burner comes provided with a 10mm thick closed-cell foam insulating jacket. The wrap-around jacket straps on to cut heat loss from the outer skin in cold, wet, windy, or snowy conditions. It is charcoal grey, the straps are red. Any heat source in the burner will heat the tub water. This does raise the interesting possibility of using methylated spirits, kerosene, diesel, fuel oil, etc. but any experimenting is entirely at your own risk. We designed it for the hot tub, but you can use the Kiwitub burner to heat other water containers. It's a very simple DIY job to connect it to just about any water container; instructions are in the Kiwitub manual. All you need do is drill two holes, hand screw in standard 50mm plumbing plastic tank fittings, then connect the Kiwitub hoses to them. The figures stack up extremely well for using the burner as a swimming pool heater. Place the burner beside the pool, connect the pool hose to the burner inlet with another hose from the burner outlet spilling back into the pool. The water picks up heat as it runs through the lit burner and back into the pool. We're still waiting for feedback on this but it looks like you could boost a swimming pool to extend the season maybe a couple of months either side of summer for the cost of a few bottles of gas. The gas tube burner makes a brilliant barbecue. Just lay stones or bricks alongside it and a sheet of metal on top. Camping shops and The Warehouse sell cast-iron barbecue plates for about $25. It's a great extra if you're camping with the tub anyway.